TOMAR'S KA-BAR KNIVES-TDI Law Enforcement Tactical Self-Defense Concealment Knives. TOMAR'S KA-BAR KNIVES-TDI Law Enforcement Tactical Self-Defense Concealment Knives. 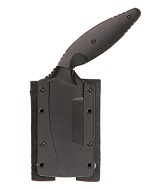 Knife comes with a friction release sheath with pre-mounted belt clip. TDI Law Enforcement Concealment Self-Defense Knives, probably the best thought out Law Enforcement knives on the market today, were designed by John Benner, founder of the Tactical Defense Institute. Weight: 0.60 Overall length: 7 9/16"
Knife comes with a friction release belt concealment sheath with pre-mounted Molle belt straps.